The Beatles and theatre group Cirque du Soleil are teaming up to produce a Las Vegas show which will replace the famous Siegfried and Roy act. Siegfried and Roy performed at The Mirage theatre for 13 years before Roy Horn was nearly killed on stage by a tiger a year ago. The $100m (£55m) 90-minute show should be ready in 20 months' time and will feature acrobatics and Beatles music. Sir Paul McCartney and Ringo Starr will not be appearing in the production. It is the first time the Beatles have collaborated on a major theatre project, said Neil Aspinall, managing director of the band's Apple Corps label. 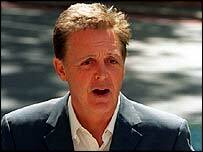 He said other offers amounted to nothing "more than a stage production with cover versions" of Beatles songs. McCartney and Starr will help out on the project, along with Olivia Harrison and Yoko Ono. It is not yet known what songs will be chosen but the production will have complete access to the band's music archive. Montreal company Cirque du Soleil has enjoyed global success with its mix of circus-style acrobatics, music and drama. More than seven million people around the world saw one of their shows last year. "They did with words what we did with images," said Cirque du Soleil founder Guy Laliberte of the Beatles. The show will take place in the Mirage's new theatre, which is currently being built - when completed, it will hold 2,000 people and offer 360-degree seating.